This was so good. 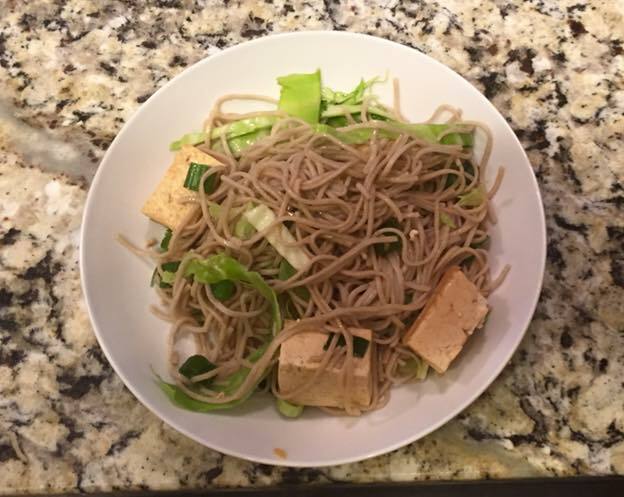 I was a little hesitant because I wasn’t sure how good the tofu would be, but it was amazing! Filling, but not too heavy of a meal. 1 14-ounce package firm tofu, drained and cut into 1-inch cubes. Cook noodles according to package directions. Drain, reserving 1/4 cup cooking water. Rinse noodles in collander under cold running water. Drain. Meanwhile, whisk orange zest and juice, soy sauce, honey, oil, and garlic in small bowl until blended. Spray large nonstick skilled with nonstick spray and set over medium heat. Add tofu and cook, without turning, until crisp and golden, about 5 minutes. With tongs, turn tofu and cook until crisp and golden on second side, about 5 minutes. Re-whisk orange juice mixture, add to skillet, and bring to boil. Reduce heat to medium-low and simmer, spooning sauce over tofu frequently, about 2 minutes. Combine noodles, cabbage, scallions, and cilantro in large bowl. Add tofu mixture and reserved cooking water from noodles; toss to coat.